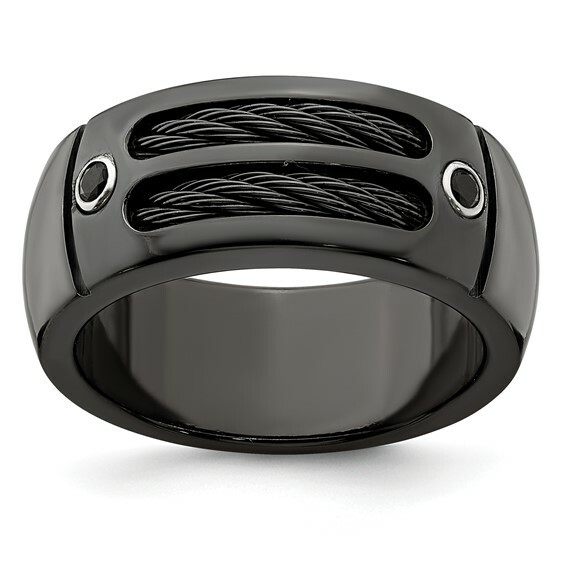 Black titanium ring features two inset memory cables and two black spinel accents. Ring width: 9.5mm. Made in the USA by Edward Mirell. BLACK-Ti - an exclusive and patented product developed by Spectore Corporation. The black is not an applied coating, it results from a unique combination of process and alloy integrated into the metal. A heat process actually turns the titanium black from the outside in. It is exceptionally hard, scratch resistant, impossible to chip and impervious to all chemistry (with the exception of Hydrofluoric acid). BLACK MEMORY CABLE - Spectore's black cable is crafted with 12 very fine strands of memory metal used extensively throughout the medical industry due to its perfect bio-compatibility. In addition to its rich stylish look, this material provides extreme durability and a remarkable ability to retain its intended profile.